We are half way through our action packed two week adventure with @VisitCalifornia and @Mighway! We had tons planned. 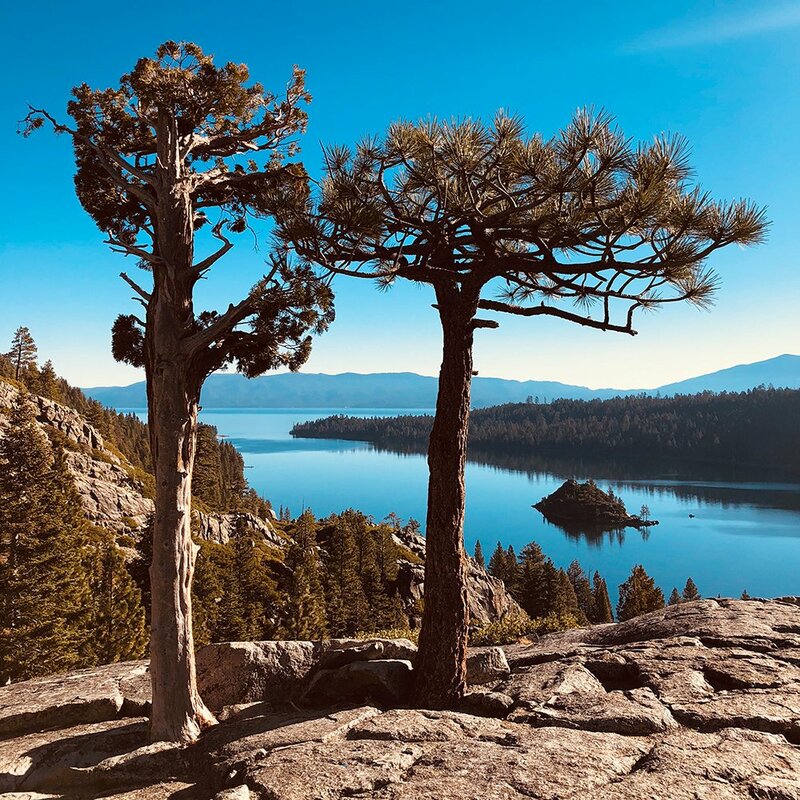 We were getting to do some things we have never got to do before and explore some of the other beautiful parts of California including Yosemite, Mammoth Lakes, and Lake Tahoe! Day 8- Our plan for today was to explore Yosemite National Park and eat lunch at Majestic Hotel Yosemite. We had a lazy morning and slept in. Around 10 am we headed for the Majestic Hotel which is about 40 minutes away from our camp. 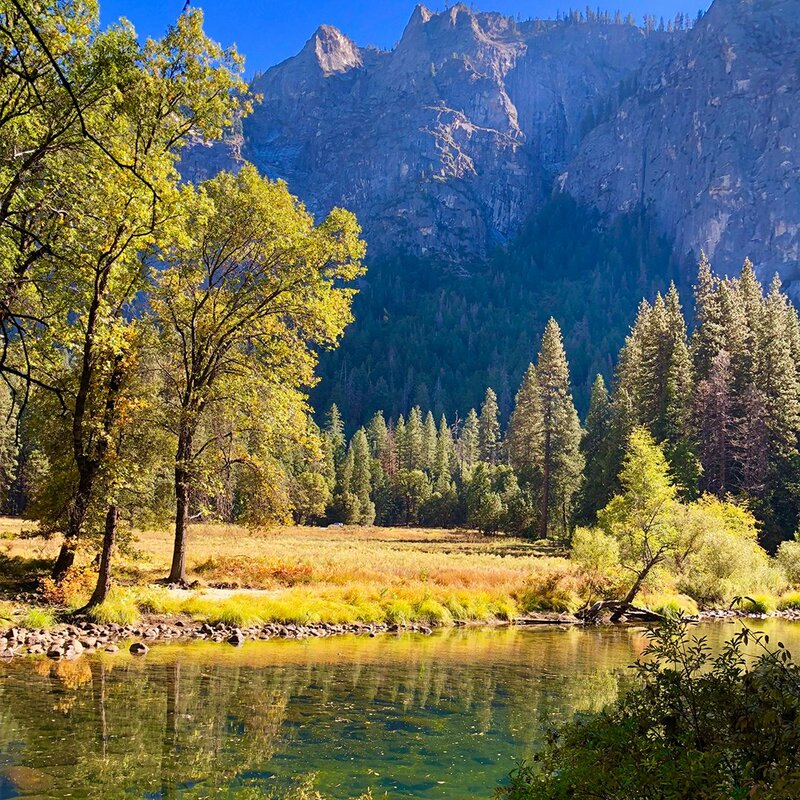 It is located in Yosemite Valley which is the main tourist area of the park as it has a lot of the main visitor attractions. 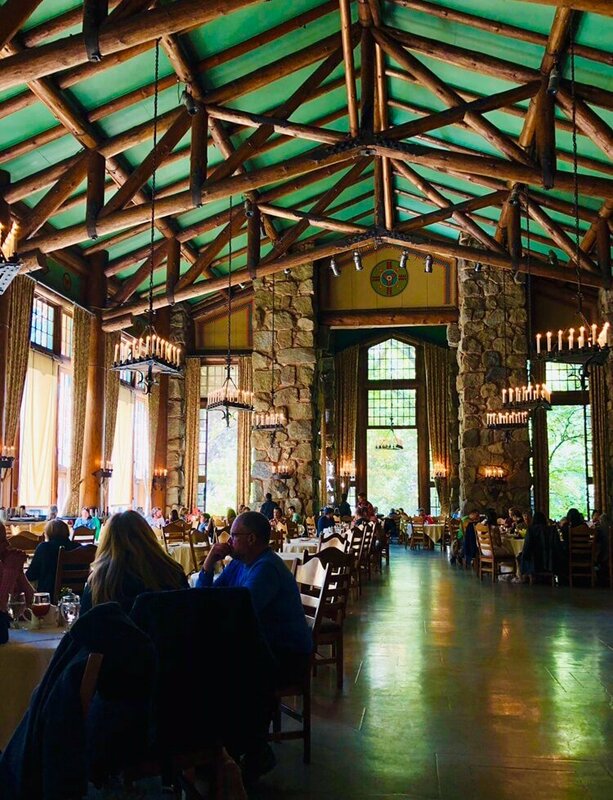 We knew we were in for a real treat to be having lunch at one of the most beautiful and award-winning restaurants in the park. 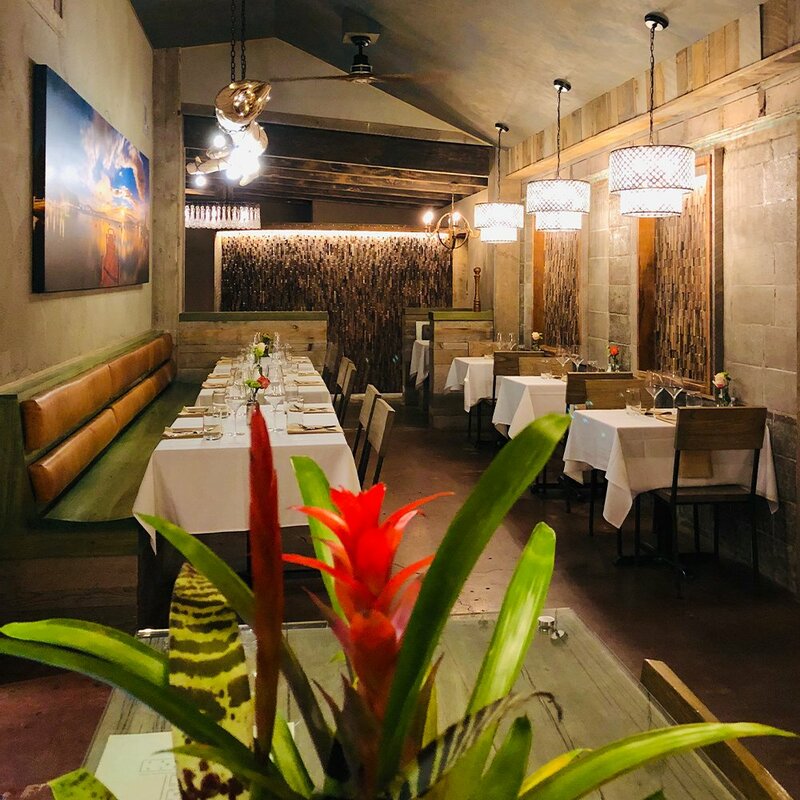 The restaurant has 34-foot-high beamed ceilings, floor-to-ceiling windows perfect for checking out the nature outside (sometimes you can see bears), amazing chandeliers, top of the line chefs, and an experience that will never be forgotten! The food was stellar and is a must have experience when visiting Yosemite. It is recommended to make reservations in advance before coming. We were super full, but ready to explore more of the park. 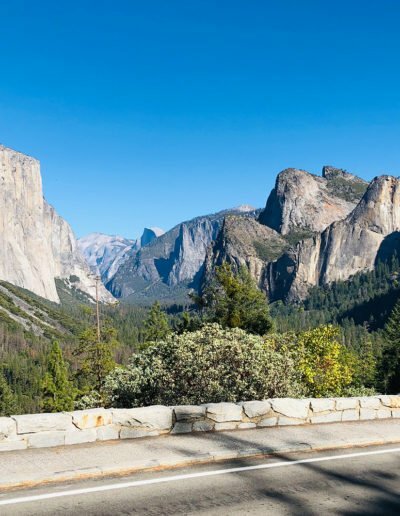 The most iconic stop in Yosemite is the “Tunnel View”. This is really a stop to not be missed. The only downfall is there is very little to no parking for RV’s. We happen to get very lucky with the timing and snagged a spot for about 15 minutes. We made the most of that time and snapped and awed over the views of the valley! It really is amazing to see what nature can create. We kept on driving, with our goal being to make it to Glacier Point by sunset. We found some of the most amazing spots to pull over and take photos along the way, as it is impossible to find an ugly spot there. 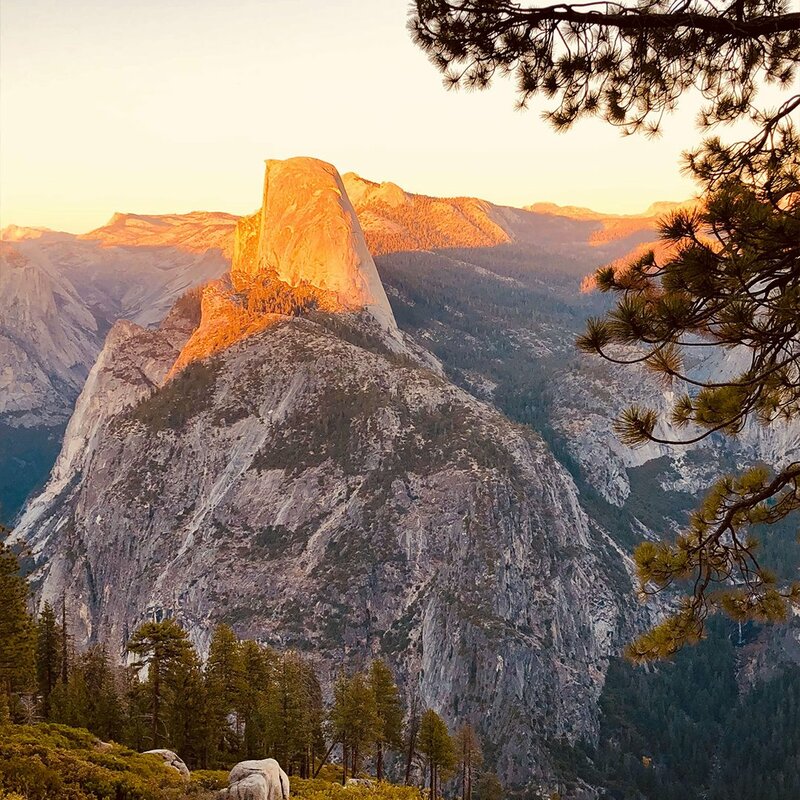 We made it in perfect time to catch the sunset at Glacier Point, and I must say WOW! Perched 7,214 feet in the sky, means you are rewarded with some of the most breathtaking views. This spot is very comparable to “Valley View” except there seemed to be more RV parking at Glacier Point. There are some nice hikes you can do along the cliffs, with epic photo ops. I highly recommend catching a sunset here or if you are into star photography then this is the perfect place! We decided to stay after sunset to cook dinner and try to snap some photos of the stars. We had planned to do a lot more this day, but just ran out of time as the park is huge. Being in an RV is a lot slower of a drive too. 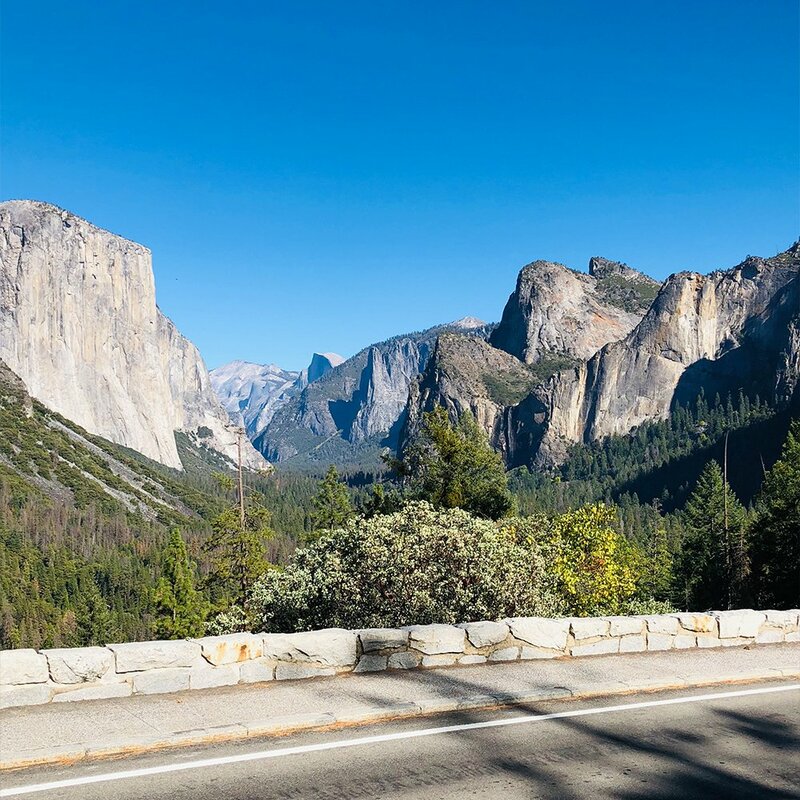 We planned on trying to do an easy hike like the Bridal Veil Falls or Lower Yosemite Falls but have now added that to the list now for next time we visit. After a long day of explore the park we headed back to camp and went straight to sleep. Day 9- The next morning, we woke up early to head to our next destination, Mammoth Mountain RV Park. 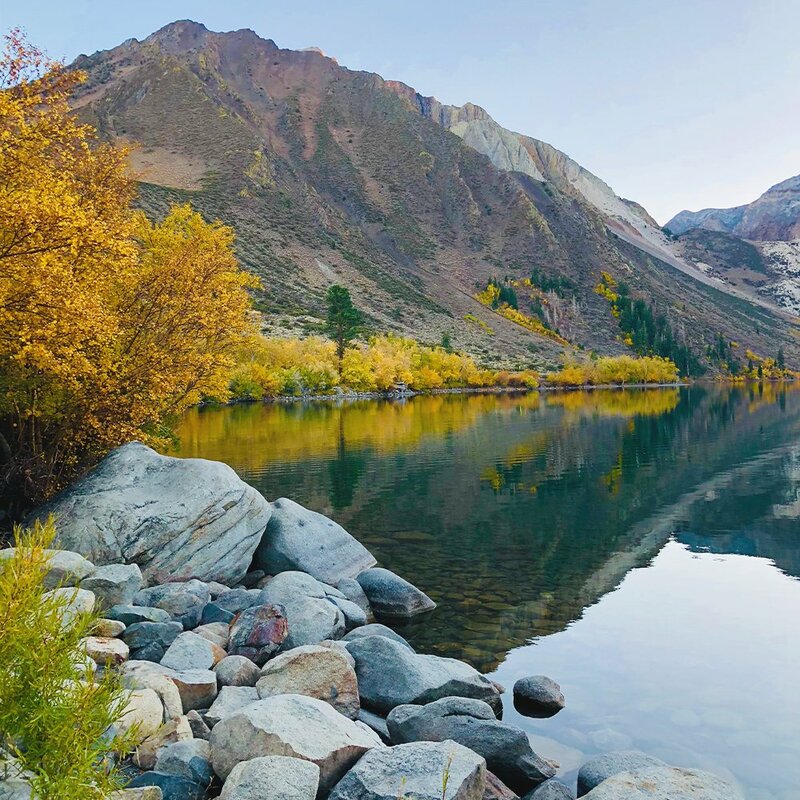 Since we were visiting in the fall, we decided to take the Tioga Pass Road (normally closes Nov-May) northeast to Mammoth Lakes. 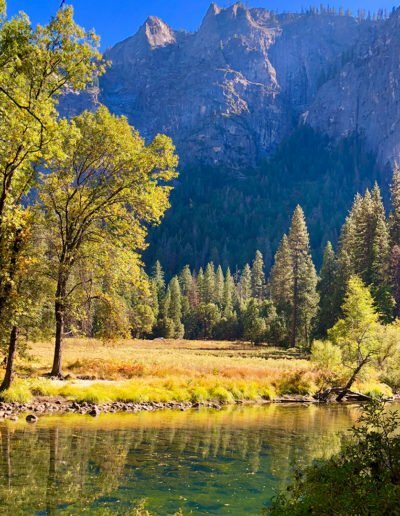 This gave us the opportunity to explore Tuolumne Meadows, and some of the lakes and rivers on this side of Yosemite. 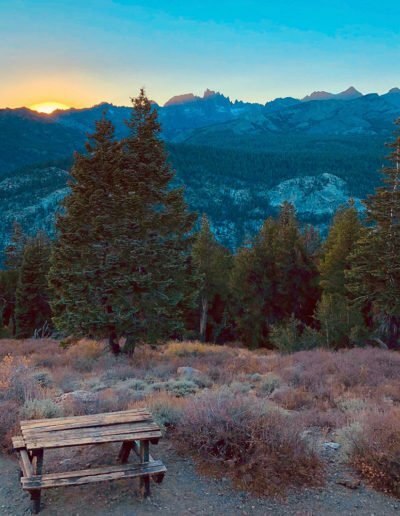 We reached Mammoth Lakes midday and decided to check into our campsite before we went off exploring again. The RV park was lovely, and it was very close to everything you need. After we got settled in, we headed off to grab a cheese and meat try from Blue Handcrafted Foods and headed up to Minaret Vista to have a romantic sunset. It was such a great idea! We drank wine and ate cheese to once again, amazing views! 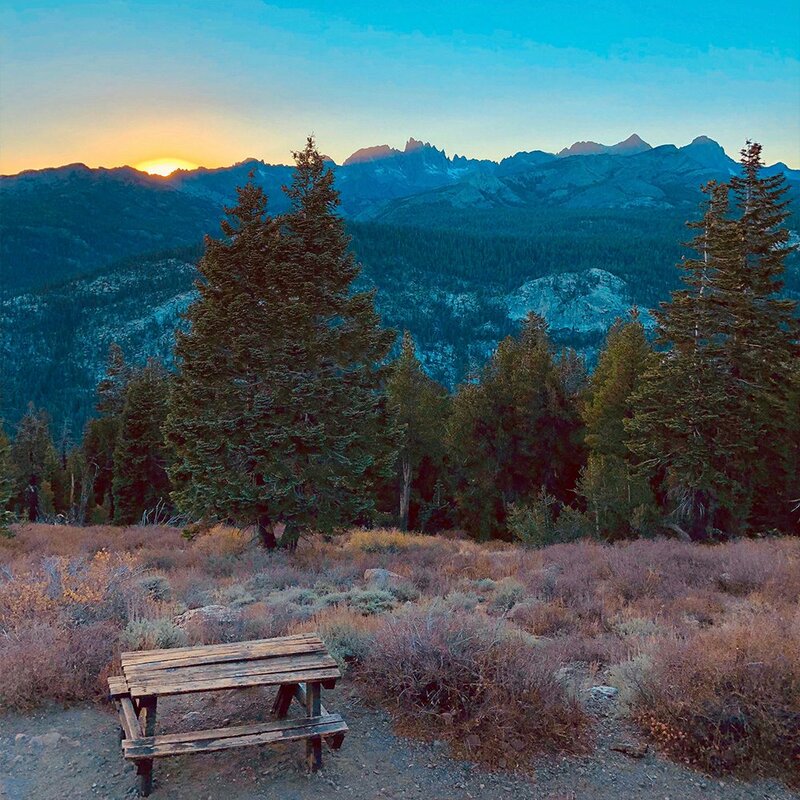 This vista point offers one of the most iconic views in the entire Sierra Nevada mountains, and is only a 15-minute drive from downtown Mammoth Lakes. We had a nice relaxing evening after sunset and had an early night. Day 10- We woke up super excited because we had scheduled a 9 am helicopter tour with SkyTime Helicopters. 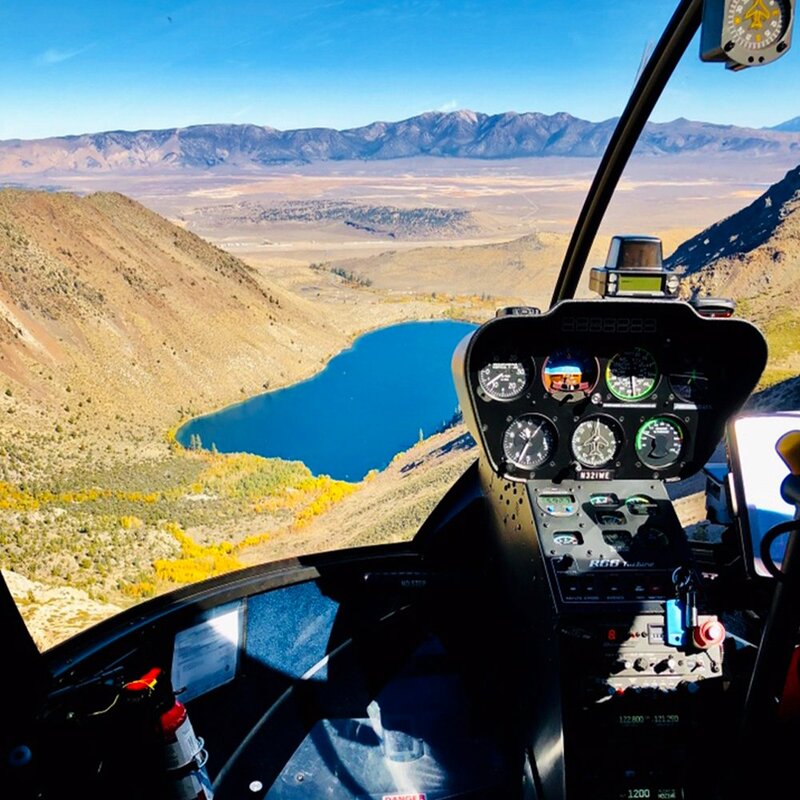 We had only ridden in one other helicopter before for 10 minutes, so we were excited that we had one hour to fly around Mammoth Lakes taking photos and videos from above. 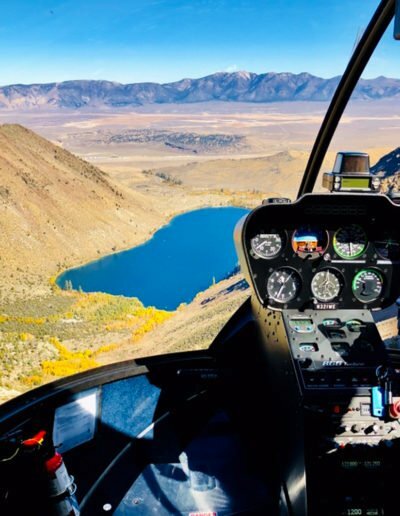 We were amazed at the beautiful lakes, mountains peaks, wild horses, hot springs, and sheer beauty that could be seen from above! We were absolutely blown away with the ride and learned so many interesting facts about the area in that one hour. 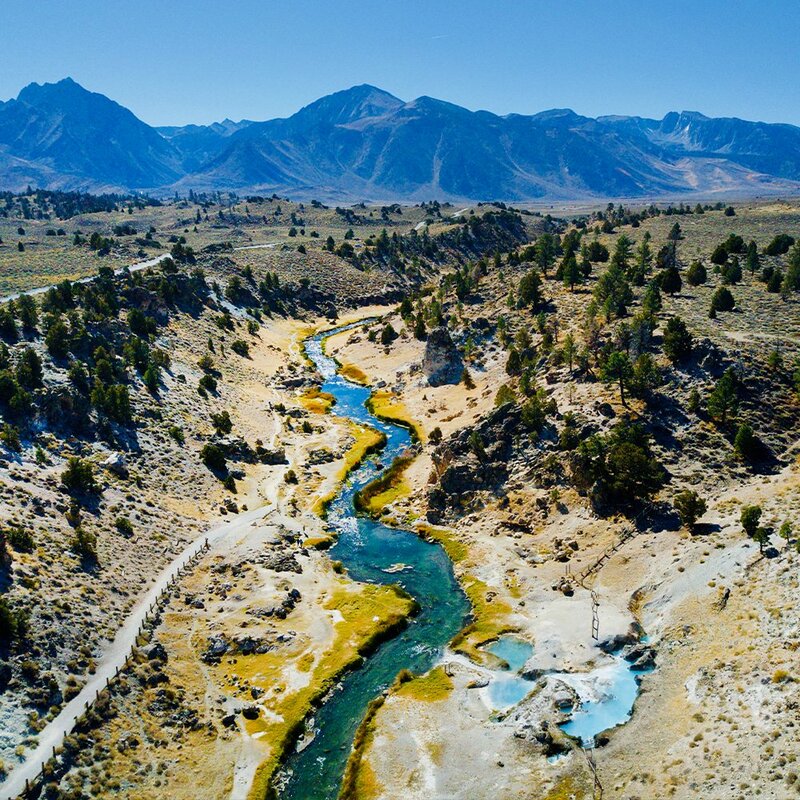 This is a MUST DO activity when visiting Mammoth Lakes. 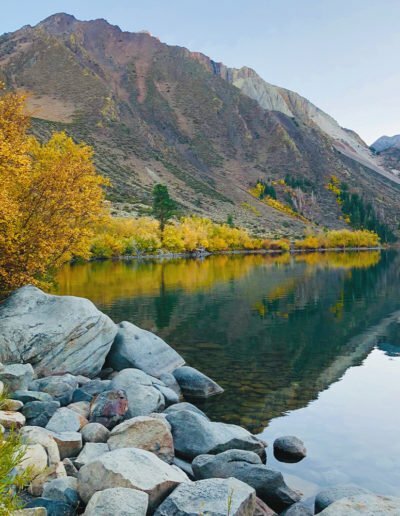 Across from the Mammoth Lakes Airport is also a place not to miss, called Convict Lake. When we went the golden trees were in full bloom surrounding the lake. I have a huge love for golden tress, so my heart was content after going here. The way the mountain ridge reflected on the lake was just astonishing and very peaceful. After a little hike around the lake, we headed towards Hot Creek Geological Site. This was a wicked place to visit with neon blue pools of steamy hot water, boiling water bubbling up from the creek bed, and small geysers. It was worth the 3.5-mile drive on the dirt road to see for yourself. You can walk down about 5 minutes from the parking lot to the hot springs below for a closer look, however, no swimming is permitted. 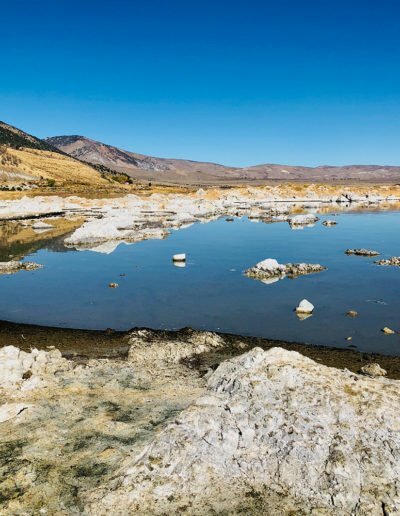 Since we were already out on the dirt roads of Mammoth Lakes, which seemed passable via RV, we headed to some other off the beaten track hot springs to do some major relaxing and soaking. The first one we went to was small and already occupied by a lovely local couple. They gave up some great insight on the area and places we needed to check out. Their best bit of advice to us was that the hot springs were “clothing option”, which we soon realized towards the end of our conversation that they took their own advice. We ventured onward to Wild Willy’s Hot Spring. This is one of the more famous hot springs due to the large size as it can hold a lot more people. It has breathtaking views of the plains with a mountainous backdrop. We fell in love with it there immediately and ended up relaxing there the rest of the evening until sunset. We got to meet and mingle with a handful of locals which made the experience well worthwhile, as we found out a lot of cool facts on the surrounding areas. We definitely had fallen in love with this little mountain town with hot springs. Day 11- We got a great night’s rest and had a day of adventure ahead of us. We packed up as our time at Mammoth Mountain RV Park was up, and we had tonight as our “boondocking” night. Boondocking is off the grid, dry camping. 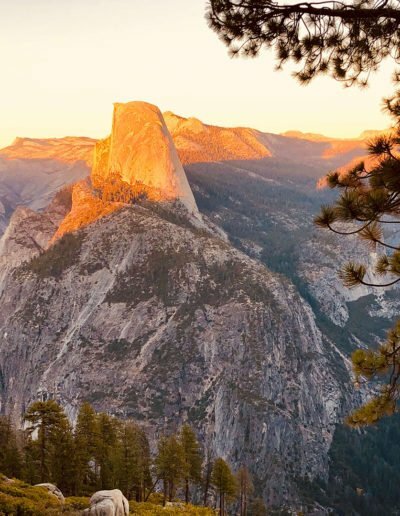 The benefits of this is you can find free campsites with amazing views. 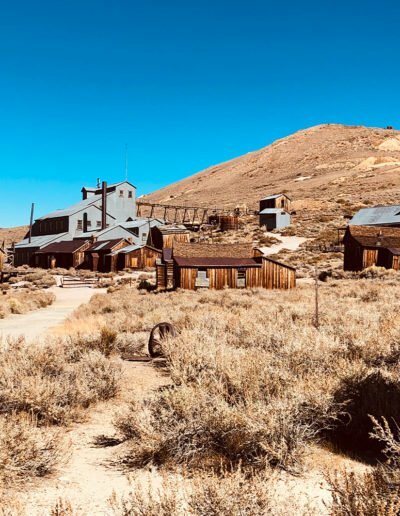 Our plan for the day was to go explore Bodie Gold Mining Ghost Town which was about 1.5 hours from Mammoth Lakes, then drive back towards the June Lake Loop to possibly camp somewhere in that area. We arrived to Bodie at lunch time, which was perfect timing. We cooked us up some grilled cheeses, quickly, before we hopped out to explore the area. 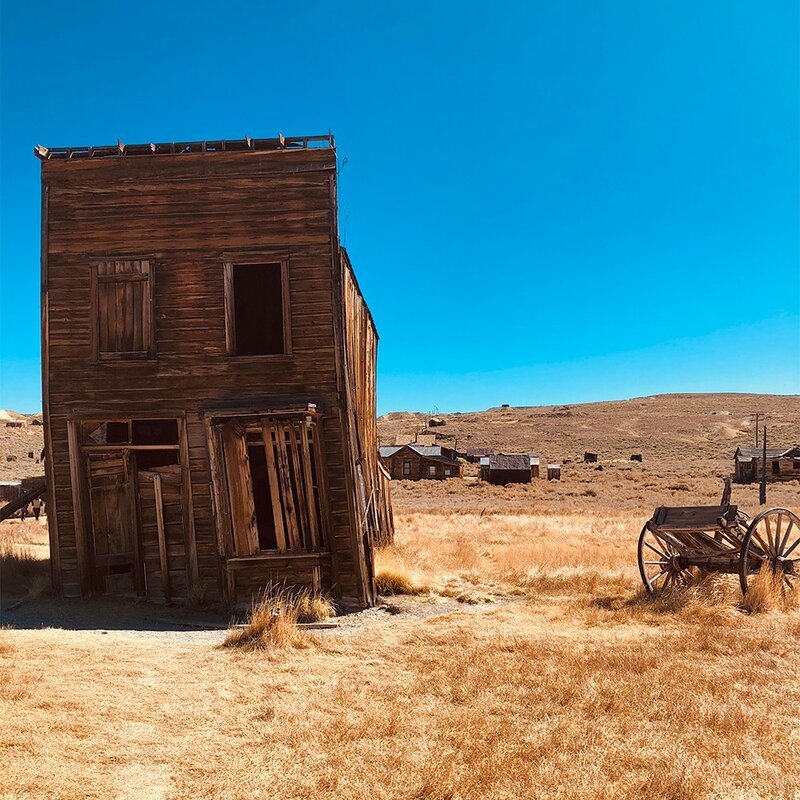 You need a solid 1-3 hours to explore Bodie as the town and buildings are spread out. 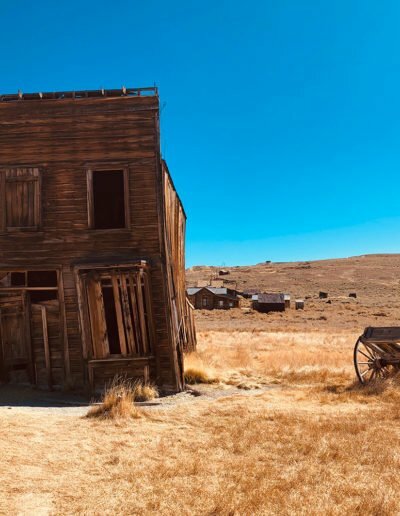 It was a booming mining town in the late 1800’s, but by 1914 was described as a “ghost town”. We found it to be super interesting to see in person. Some buildings you are able to still walk in, while others are on the brink of falling down. For $2 you can buy a walking map from the rangers when you come in ($8 per person), which give you the history behind each building. We found it very helpful and was a cool souvenir to keep. 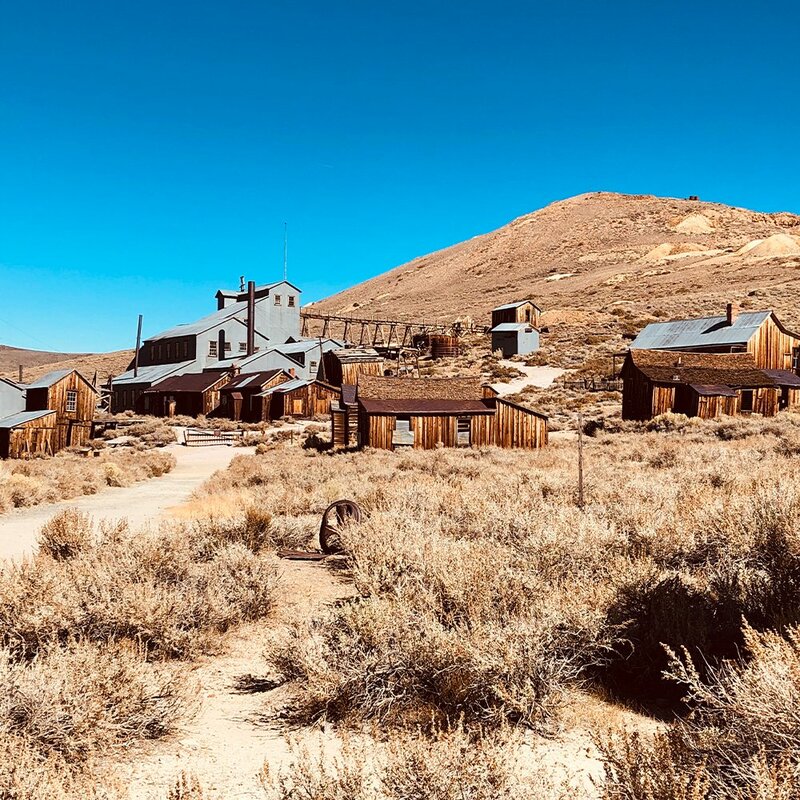 After exploring Bodie, we headed off to drive the June Lake Loop. 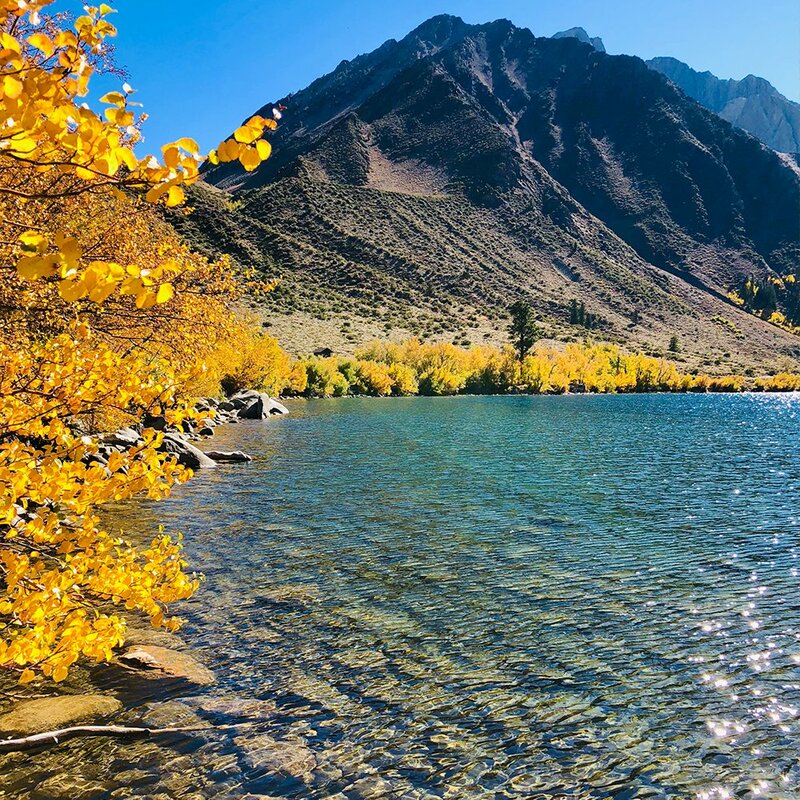 This area is well known for golden yellow trees in the fall, and beautiful alpine lakes. 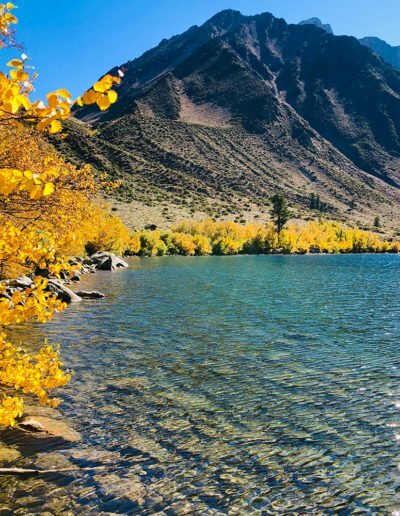 It is a 15-mile loop that starts and returns to U.S. Highway 395. 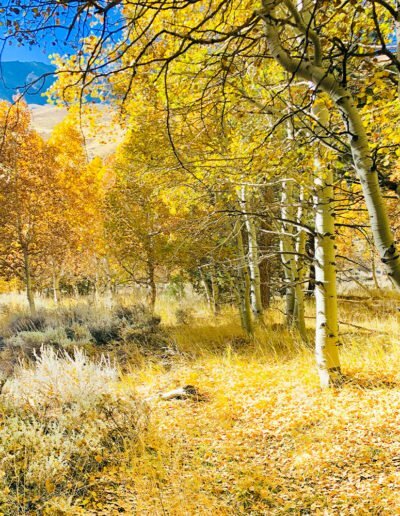 It only takes about an hour to drive if you don’t stop, but plan on spending 2-3 hours stopping at the lakes and golden trees the drive has to offer. 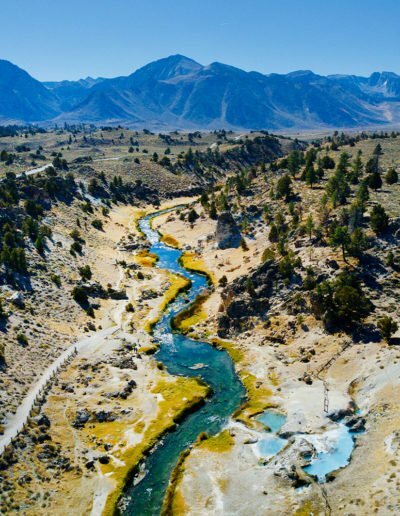 We had done out research and knew there were several BLM (free land you can camp on for 14 days) and boondocking areas around Mammoth Lakes. We had been scoping it out the past two days, keeping our eye out for the perfect camp spot. We decided on the hot springs we first visited where we met the lovely local couple. It was perfect since it had a huge flat surface that was level with amazing 360-degree views of the Sierra Mountains. Plus, the hot spring was only a football throw away and FREE! It didn’t get much better than that. We sat and watched the sunset peak behind the mountains as the sky turned a fiery red. We cooked dinner and enjoyed the stars the rest of the night. It was the perfect camping spot! Day 12- I woke up to the most beautiful sunrise out of our big bedroom window. This is what I had been dreaming I’d wake up too. So, I am super thankful I got to start the day with those views. Today was the day, we headed to Lake Tahoe! This was somewhere we both had dreamed of going and wanted to explore for ages. There is a very good reason it is so popular. It is a spectacular place to visit. We cruised about 3 hours up HWY 395 N to our campsite for the next three nights, Tahoe Valley RV Resort & Campground. 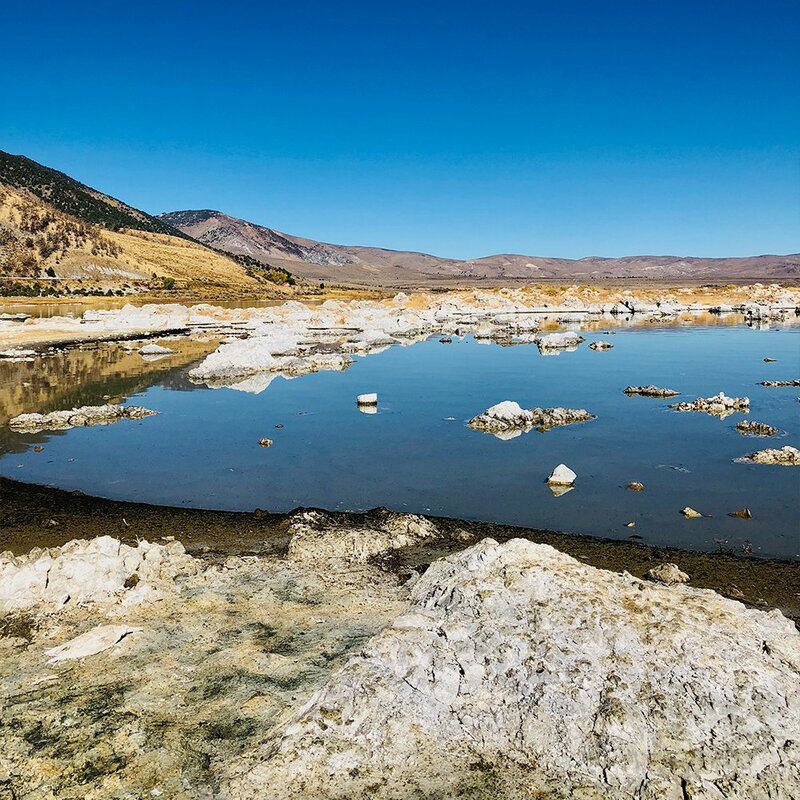 We did make a pit stop at Mono Lake, which is an ancient lake, over 1-million-year-old. It is one of the oldest lakes in North America. It is also super salty, literally. You are given the chance to capture mountains, desert, and water in one photo. It is also a lake that can be seen from space and NASA protected, which is cool fact! It was worth a quick stop to see the cool tufa towers, which are calcium-carbonate structures that are formed from underground springs. They mix to form limestone, which then creates the 30-foot+ tall structures that can be seen today. We kept on trekking to South Lake Tahoe and made it to our campsite to check in mid-afternoon. We were camping on the “locals” side of town, but it was not far to get to places in Lake Tahoe. We found that Lime Scooters were the cheapest mode of transportation if the weather permitted. We did take a couple Uber and Lyft here, as we ended up not moving the RV for the entire three days that we were there but it did add up. 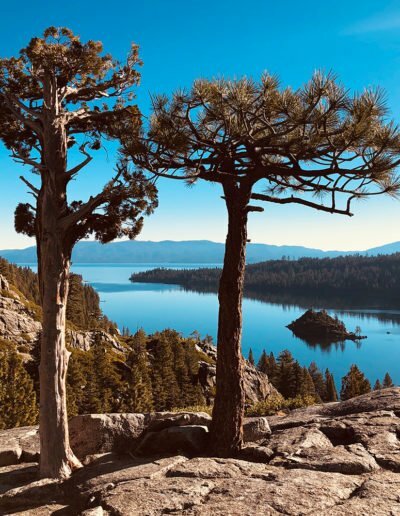 We were told that Lake Tahoe is one of the most expensive places in California to Uber/Lyft, so it is recommended to rent a vehicle when visiting this area. Once we got settled in, we decided to head to one of the local breweries that was in walking distance called Lake Tahoe Aleworx. They had an awesome beer/cider system, and a relaxing patio with live music. You give them your card to hold in exchange for a beer/cider tap bracelet. Then you head to the tap wall and sample as many as you want until you find one you like. The bracelet is charged per ounce you pour. Then at the end, you pay whatever you charged onto your bracelet. I loved this idea, as you didn’t have to wait on a bartender. If you are into craft beer or cider this is a must stop when visiting Lake Tahoe. We then headed for our reserved dinner at Cold Water Brewery & Grill. Debbie, the owner of the brewery, opened us with welcoming arms. She was such an inspiring lady, following her love of brewing craft beer and cooking delicious food. There is a good reason and truth behind their slogan, “Great food, great beer, great people!” We couldn’t agree more! Rhys and I decided to try something different to start out with which was fried artichoke chips and bacon wrapped dates. The combinations of sauces and flavors exploded in our mouth. It was different, but so good! Next up was the 14 oz bone-in pork chop with a delicious apricot chutney covered in a maple bourbon glaze. Yum! We got spoiled with amazing food and enjoyable beer! After a day of brewery hopping it was time to call it a night. Day 13- We grabbed breakfast sandwiches and coffee next door to the campsite at a rock-climbing center that had a café attached. 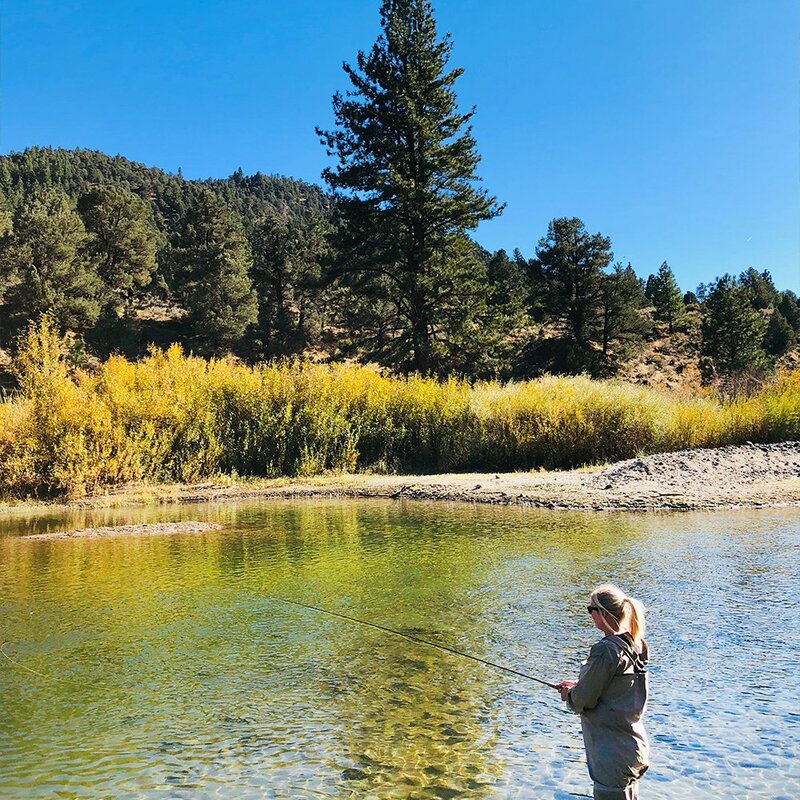 We set out today to go fly fishing for the first time ever with, Tahoe Fly Fishing. We met our angler, Eric, at the shop at 10am to get our gear fitted, and then headed out on our 6-hour adventure to the East Carson River. 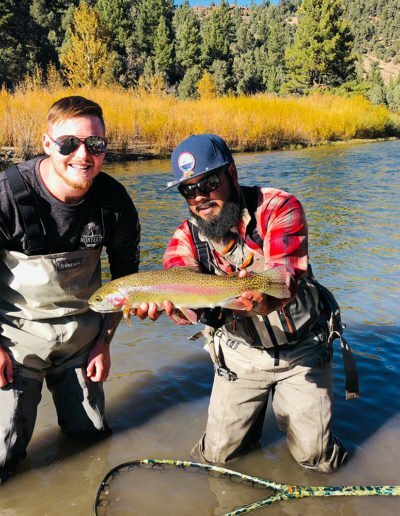 The price of the trip includes your guide, boots, rod and reels, and flies. Fishing permits and gratuity were an added expense. It took about 45 minutes to get to the trail that we were taking down to the river. Then about 30 minutes to hike to the perfect spot for him to teach us how to fly fish. It was very secluded, with breathtaking view! 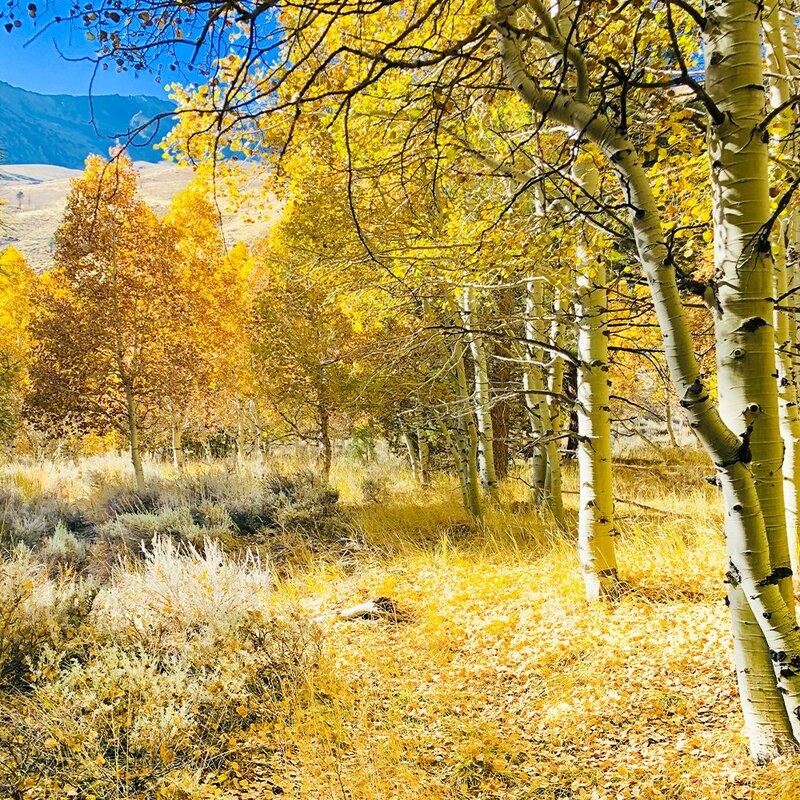 The golden trees with the stream and mountainous background was the perfect place to learn to fly fish. After an hour or two of practice and learning the proper techniques, we hiked a bit further down river to try out our newly learned skills. After several hours, lots of fish bites, and trying different techniques we had caught nothing. We still had hope though as we knew Eric was an expert and still had an hour left. We hiked a bit back up stream in hopes that the last spot, was going to be “THE” spot! We felt like we had the hang of it down. 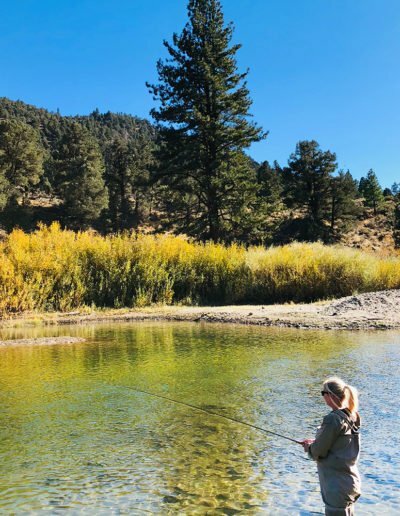 The thing with fly fishing though is you have to be ready. 100% full concentration is required. 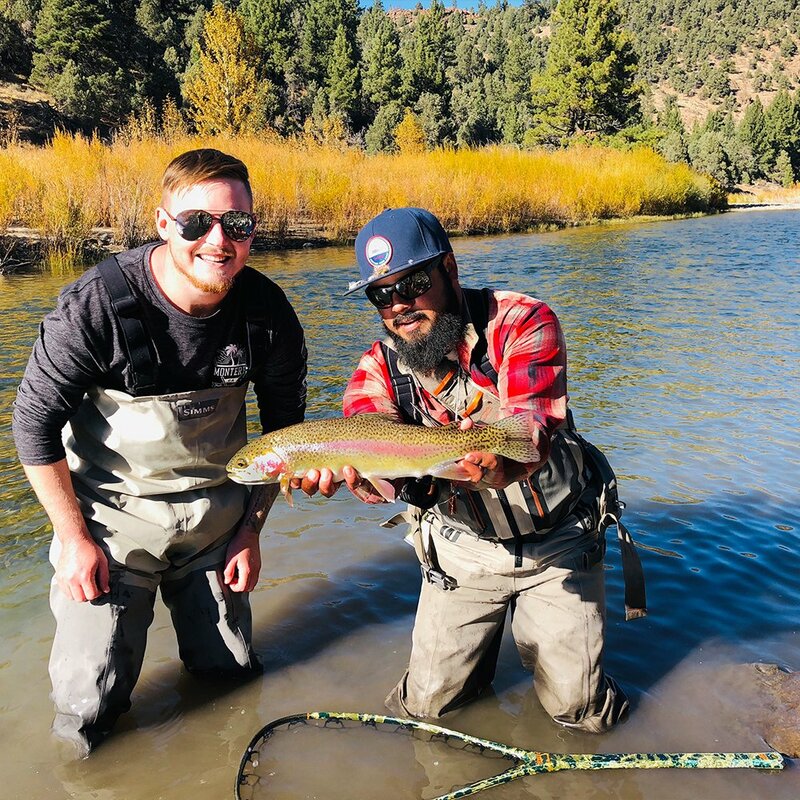 Finally, at last, Rhys snagged him a beautiful 19-inch Rainbow Trout! And boy was it a beauty! It was a moment of the trip and our life that we’d never forget. Sadly, I didn’t catch a fish, but watching Rhys fight to reel it in, made it all worth it. It was time to head back to the campsite, shower, and get ready for a nice dinner at Jimmy’s Lake Tahoe. We had built up an appetite after hiking and fishing all day. After we washed and dressed up, we hopped in an Uber and headed to Jimmy’s Restaurant located at The Landing Resort & Spa on Lake Tahoe. We made it just in time to catch a glimpse of the sunset over the lake. The ambiance is the restaurant was lovely, with wood burning fireplaces, fancy décor, and an amazing 1,500 bottle wine cellar. For our starter we opted for the Greek appetizer called Kataifi. This was crispy wrapped feta, raisin oregano dressing, and Greek organic honey! By far my favorite thing I have tasted. I have a love for feta and eating it this way just topped the charts! Next up was the entrées. I went with the steak salad while Rhys went with the Colorado Lamb Rack. They were both delicious! I was so full, but the server convinced us that we MUST try the chocolate mousse cake! He wasn’t lying… By this point, we were beyond exhausted from fishing all day, and ready to head straight to bed to recharge for the next day! Day 14- We decided to have a little bit of a sleep in as our trip was catching up to us. We were tired and needed a good rest. 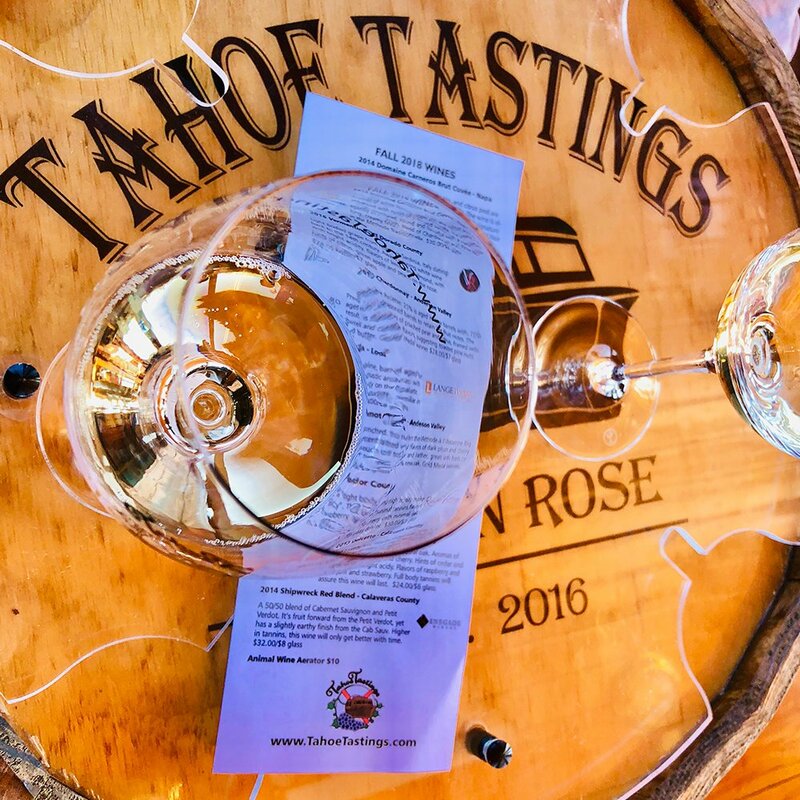 We had a big day planned with Tahoe Tastings to go out on Lake Tahoe and explore the area while getting to sip on some of the best wines Northern California has to offer! We arrived at the marina at 11am and hopped on the “Golden Rose”. This boat was a one-of-a-kind 1953 Chris Craft Venetian Water Taxi. Its wooden appearance, and elegant layout was stunning and soon it would be taking us around South Lake Tahoe and Emerald Bay. 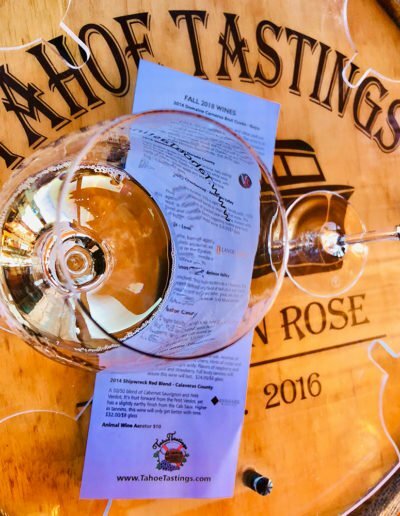 The tour was 2 hours long and full of information about the area and facts about the wines. We learned so much, and even had an extra glass of the Pinot Noir as it was my favorite of them all. 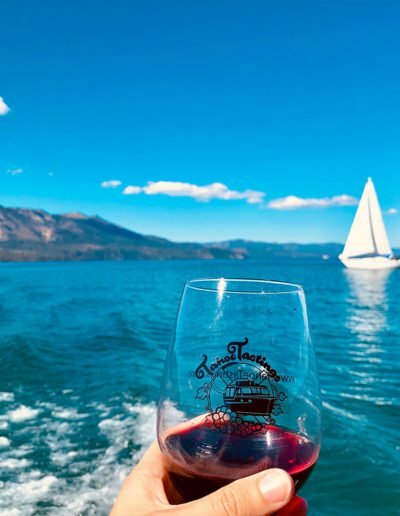 The boat is one of the more intimate wine cruises you can do on Lake Tahoe as the max number of guests it holds is 28. We were about to meet a lot of amazing people during the boat ride from all over the US. 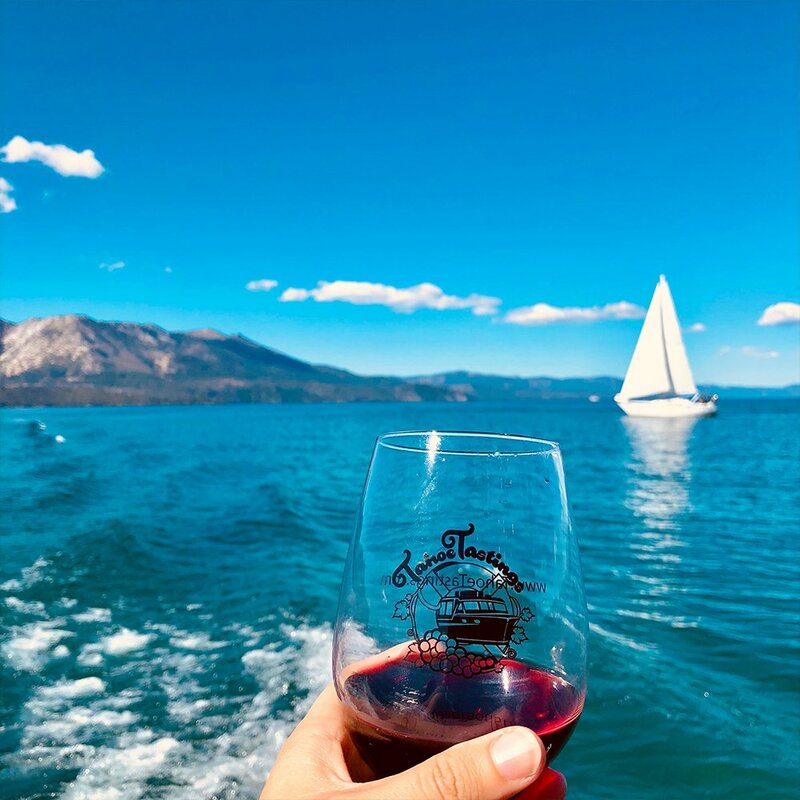 It is the perfect way to drink wine, explore Lake Tahoe via an amazing boat, and meet some great people! 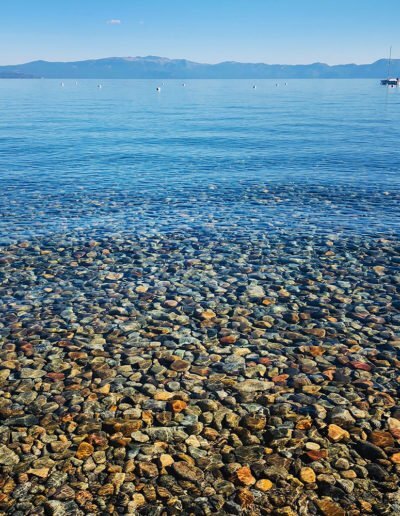 I highly recommend making this as one of your activities when you visit Lake Tahoe! We ended up spending the rest of the afternoon enjoying the area by Lime Scooters, before our dinner reservation at The Lake House Restaurant. Luckily, it was just a 2-minute walk from the campground to the restaurant. 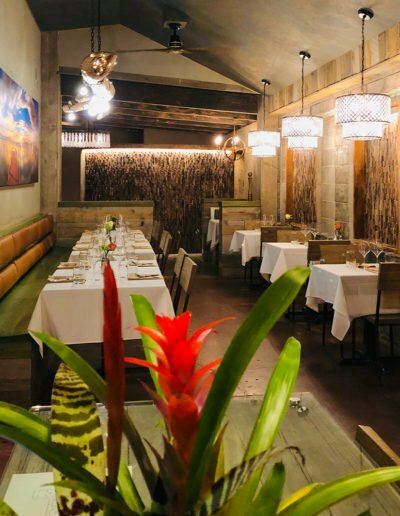 It had a peaceful ambiance on the inside and a cheerful server who knew the menu well. She recommended us splitting the Filet Mignon and King Crab Legs so we could get the best of both worlds! The steak was tender and cooked perfect, and the crab legs just fell out in huge chunks with the best flavor. The food was superb and exactly what we needed to end an amazing day exploring. We walked back to the campsite and reminisced on our adventure since it was all coming to an end as of tomorrow. This was the last night we were sleeping in the RV, and it was safe to say, we had fallen in love with the RV life and were sad to be “moving” back out. We did our final pack up and clean before we headed off to bed. Day 15- We woke up sad to know that we had to drop off the RV today. We had a long drive from Lake Tahoe to San Francisco and planned to make a day of it. We had until 4pm to return the RV so we made the most of every minute we had in it. We drove up the lake to North Lake Tahoe. During the drive we were in awe of the amazing views the drive offered. Plus, not to mention the houses you see will inspire you for your dream home! These were some of the biggest mansions I have ever seen, and it wasn’t just a couple, it was hundreds of them scattered around Lake Tahoe’s shoreline. We stopped a couple of times for photo ops. 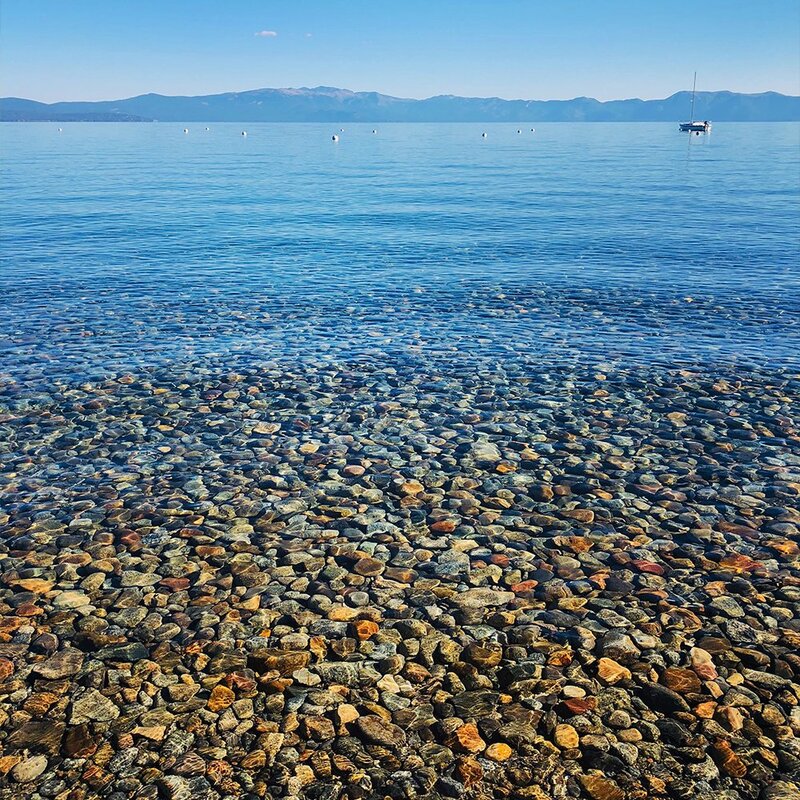 Since some of the drive is up in the mountains, you get amazing views of Lake Tahoe for as far as the eye can see. We eventually made it to a cute little mountain town called, Truckee. The downtown area is so cute and feels like you have stepped back in time. We grabbed lunch and kept on trucking to get back to San Francisco in time as we still had a 3-hour drive ahead of us from here. We made it to the RV place just in time. 4pm on the dot. We were dreading this moment since the start of the trip, but were so thankful for all the memories and adventures we were able to have in this RV. We packed our things into an Uber and headed for an airport hotel for the night. Our flight was the following afternoon, so we just relaxed until then. Northern California treated us so well and showed us some amazing things. We had traveled a lot in Southern California, so to be able to experience what Northern California had to offer meant so much too us. I can safely say that the whole state of California has so many different landscapes and is the ultimate place to go RV’ing around! 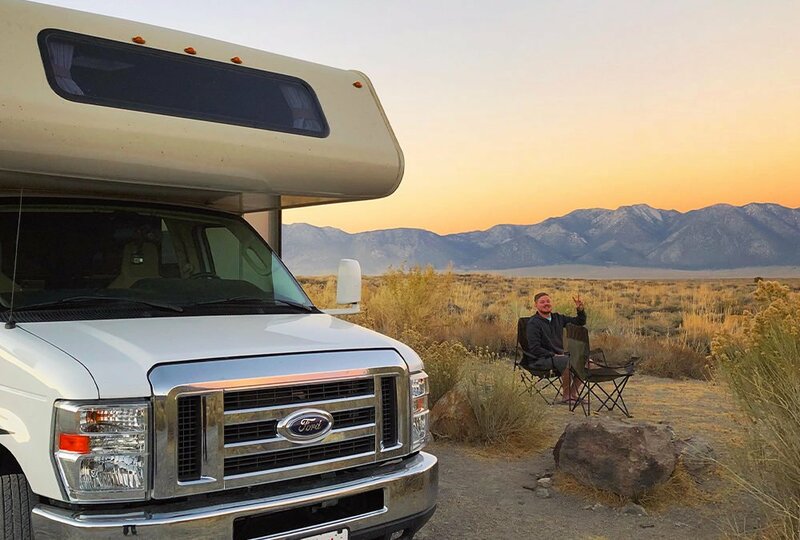 Don’t forget about Mighway RV for your next adventure. They can make your dream of RV’ing around California a reality at an affordable cost. They made our dream a reality and we will forever cherish those memories.